Love and chocolate go hand in hand. That's why this time of year is full of chocolate hearts. It's not hard to take a little leap and make some amazing aphrodisiac candies with dark and decadent chocolate. It also helps that dark chocolate is actually very good for your heart. So here's my favorite recipe that is great for both heart and libido. Cacao is the main ingredient in chocolate making. It's super supportive of the cardiovascular system, anti-inflammatory, full of antioxidants, a stimulant, and relaxant. It also contains small amounts of phenethylamine, which enhances our mood and increases our sense of “love.” This applies to cocoa butter as well cacao nibs/powder. 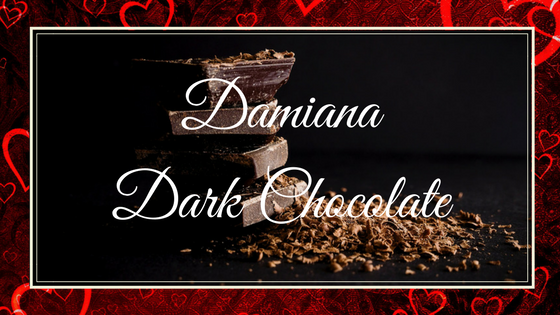 Damiana is one of the most well known herbal aphrodisiacs in the world. This little flower was used by the Aztecs for just that reason. It increases circulation to the sexual organs, which also makes it great for those with anxiety or depression, and helps to balance the hormones. You can read more about this amazing herb here. Rose is an optional ingredient in this recipe, but it is also an aphrodisiac and antidepressant. Plus we associate the smell of rose with romance and adding rose to any aphrodisiac recipe increases that feeling. Cardamom is another optional ingredient in this recipe. However it's another herbal aphrodisiac. Plus the flavor of cardamom may seem strange to add to chocolate, but it's so delicious, especially with rose. Read more about this herb here. Cayenne is a great optional ingredient. Adding cayenne to dark chocolate adds an air of the exotic. It's also a great way to boost your aphrodisiac power. Because it works so well to increase circulation, it helps to carry the effects of your other ingredients more efficiently, and a little bit faster. Making it a great addition to any herbal recipe. Combine Cocoa Butter, Coconut Oil, and herb(s) in a heat proof bowl. Set the bowl over a pot of simmering water, being careful not to let the bowl touch the water. Allow the ingredients to slowly melt and incorporate. Allow them to infuse for 20 minutes or more. Strain out the solids, making sure to squeeze the herbs well, to get out all the infused butters. Return the butters to a bowl over simmering water. Add in all other ingredients (if you're using sugar, put that in first to melt before adding other ingredients). Adjust sweetness if desired. Stir until smooth and shiny. You can go the easy route and make this into a chocolate bark simply by lining a cookie sheet with wax paper then pouring this chocolate over the paper and freezing it. Once frozen, break it up into pieces. You can also use this to dip aphrodisiac truffles (such as these bliss balls). There are also some really cute candy molds out there these days. Get creative! But don't forget, if you are going to use molds, make sure they are completely dry before pouring in your chocolate, or you'll get little bubbles in your chocolate. I hope you enjoy making these delicious chocolates! If you have any questions or comments, please leave them below! Also join my friend, Ms Lisa Ray at the Florida School of Holistic Living this Valentines Day for a class all about making herbal chocolates!